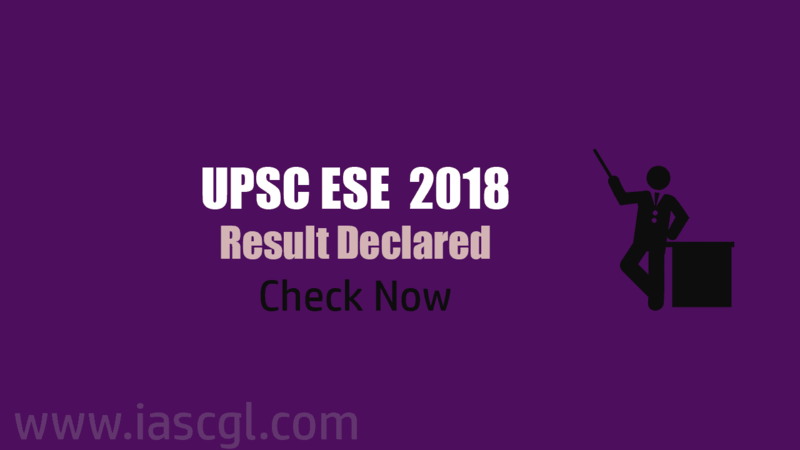 Union Public Service Commission has declared result of Engg Service Prelims Exam(ESE) 2018. Candidate who appeared in the examination can check their result at official website of UPSC at upsc.gov.in. The Prelims ESE 2018 exam was held on 7th Jan 2018 across the country. There was 2 paper in Prelims exam, General Studies and Engineering Aptitude. The candidates declared qualified are required to appear in the Engineering Services (Main) Examination, 2018 to be held on 1st July 2018. The qualified candidates are further advised to refer to the Rules of the Engineering Services Examination, 2018 issued by the Ministry of Railways and the Examination Notice No.01/2018 dated 27.09.2017 issued by the Commission which is also available on its Website. The candidates may download their e-admit cards from the Commission’s Website around 3 weeks before the commencement of the Engineering Services (Main) Examination, 2018. Candidates are also informed that marks and cut-off marks of Engineering Services (Preliminary) Examination, 2018 will be uploaded on the Commission website i.e., www.upsc.gov.in after the entire process of Engineering Services Examination, 2018 is over i.e. after the declaration of final result of Engineering Services Examination, 2018. No request for change of Centre/discipline for Engineering Services (Main) Examination, 2018 will be entertained under any circumstances.